We love this car. 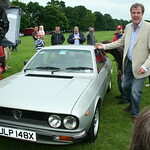 I actually prefer to drive it on our (bad) twisty B roads over our 09 plate Alfa GT! It has much more supple suspension and the torque is similar to the Cloverleaf! Soon after getting back from Paul Greenway's home in Chorley I made a list of must do jobs that I wanted to finish before the 40th celebrations later this year. Paul was absolutely correct in the fact that it would "pass the 5 yard test" of viewing, but once closer the snags and faults appeared. Remove over spray from sunroof rubber, and cleaned around opening. Remove stuck on aerial and made good paintwork. Found proper rear o/s aerial to rear wing, fitted and got radio working properly. Replaced filler cap with "Y" shaped original. Removed, restored, and replaced most body rubber rub strips to sides with unmarked ones. Removed, restored, and replaced both mirrors. Removed front headlights and grill. Replaced with good Siem examples, replaced surrounds and grill with better examples. Fitted original front fog lamps after restoring them first (used existing loom and proper switch). Replaced rear lamp unit plastic screws with proper colour originals. Restored and replaced rear fog lamps and brackets. Sourced and restored original Lancia period rear mudflaps, fitted properly to rear. Found and replaced the rear spoiler with mint example. Logos also changed. Restored rear wash wipe arm. Replaced rear tailgate problem strut, along with aperture rubber, tailgate lock, and all rusty screws. Refitted rear number plate properly. Sourced early Beta Chrome gear stick and "HF" Knob. Fitted. Sourced and fitted an Abarth Boomerang steering wheel and boss. Sourced double power binnacle lamps, now I can see the oil pressure gauges at night! Fixed "ticking" noise behind binnacle. (Speedo cable misaligned). Replaced inner locker back plate. (Missing). Replaced left and right speaker covers with good ones. Completely stripped out whole interior. Cleaned replaced and restored VX cloth trim panels, seats etc using the best from 3x VX interiors! Restored door cards, stainless trim, latches and handles. Replaced door checks, (big improvement). Replaced door rubbers with unworn examples. Replaced two of the 3 incorrect door window seal strips. Door tops now much more original. (The final one will be replaced later along with both of the side glasses. (Glasses vertically scratched). Replaced all incorrect / rusty screws to interior. Replaced carpet with 20,000 mile only example. (Big improvement). Restored front seat belts and replaced any damaged plastic trim. Centre console now rebuilt and looking mint again. Restored rear seat cards, replaced damaged drivers seat etc. Restored replaced all toolkit items and got jack re-enamelled. Replaced boot carpet with mint-ish example. Replaced broken latch plastic surround. Sourced black leatherette to get new strips re made for rear boot wheel arch covers, (got re sewn at saddlery)! Rear wash wipe arm re enamelled and unit now works. Replaces many trim items around rear slatted grill on tailgate. Re-secured rear number plate light housings. Started cleaning the engine bay. Front of scuttle now very good. Replaced incorrect washer bottle and damaged jet mounts. Cleaned rear of bonnet. Bonnet now has a new replacement black cover. (Very smart). Many of the extraneous brackets etc and struts have been shot blasted, nickled or re- enamelled. (To be progressively refitted). Both cam covers have been blasted and sprayed with black crackle finish paint, (these are yet to be fitted). Best 5 alloys from 10, stripped, cleaned, tyres removed and expertly re-enamelled. The Toyo tyres refitted. Centre Lancia logos replaced with new ones. All wheel bolts have been stripped and re-chromed as well to finish the look! The stainless "Powerflow" larger bore exhaust and 4-2-1 manifold from the other HPE has been renovated, and now looks like new. This will go on in due course. (That will free up some extra bhp hopefully, whilst not being overly loud). Then on the 30th Jan, she took a trip down to Wesson Lancia near Exeter, where she had the majority of the rot taken out. (The front screen taken out, scuttle replaced, replacement tailgate glass fitted. Then both big areas have been re sprayed and internally wax oiled etc). That has now been done. We are both very pleased with the result so far. (Not perfect as there is a "hidden nasty" rust spot within the LH door that will eventually require surgery). However to do that, then the problem of blending resprayed panels emerges, along with the pin stripe that is continued down BOTH sides etc. The upshot of this is "wait and watch the small rust areas, then bite the bullet and respray the whole thing so it matches exactly then". To do all that at present is uneconomic use of time and money. So in a nutshell by the end of Feb she hopefully could stand a "one yard test" apart from the LH door and the minor scrapes on the offside wheel arches etc. Door window glass to be replaced, as both are scratched. Black window / door surrounds to be re enamelled. Someone has used hammerite on these and it looks ugg! (At present I have stripped a complete set and supplied to Smart Carz of Chard for blasting, etching, high build priming and re satin painting. The rear opening windows will then be rebuilt and have the tack welds re-applied). Nearside door will nead surgery or new skin at some point. Then glass and final rubber trim will be fitted. (Not urgent). Engine bay to be cleaned up to a good standard, and painted / zinc'd parts re-assembled. (Later on). Fit the restored stainless Powerflow exhaust system! As you can imagine we have got quite attached to her. Here are some pictures to be going on with. Hope you like! Wow - that looks great. I'm not a great lover of the HPE but that looks fantastic! Amazing what TLC can do for a car! thanks guys, I appreciate your comments. I will post some more pics next week when the window trims come back form Smart Carz in Chard. Then once the window frames are rebuilt she will look really good I think. Looks stunning Chas Great attention to detail stuff! Great looking car well done. Not bad. Don't like the fog lights in the air dam. They look naff, sorry. Not keen on the steering wheel or wooden gear knob either. What happened to the originals? Given you seem to be trying to return it to OE spec why these after market items? The stripe I do like. Re the Zegna cloth Eric. I thought it had all gone? I met a chap about 6-7 years ago who had 6-7m of the last of the OE cloth. I think that was used to retrim a silver HPE ie whose reg I knew but now excapes me which is now sadly rather worse for wear last time I saw it. The Zegna cloth looked and felt good but it wasn't at all durable. It faded badly and easily wore through. I really like that steering wheel - and I want one! What is it? And do you know if it will fit an S2 Spyder? thanks for the info re the fog lamps. I am not sure whether these are Carrello items, but they looked of good quality and have a lovely "retro yellow" brightness when on! The wheel is a standard Abarth "Boomerang pattern" wheel that may have been fitted to several Italian sporting cars, my Fiat 128 3P had this one when we bought it, (but that was an "aftermarket fitment"). The boss pattern is a standard MOMO spec, ie 6 hole at 70mm PCD, so you will need a specific wheel boss for that as well. I liked the style because it was similar in shape to the original but slightly smaller and more sport specific. An homage maybe? Looking forward to getting the door / window trims back from the sprayers this week. The wheel is a standard Abarth "Boomerang pattern" wheel that may have been fitted to several Italian sporting cars, my Fiat 128 3P had this one when we bought it, (but that was an "aftermarket fitment"). Theres a boomerang steering wheel on e-bay, no bids at the moment, seller reluctant to post though,collection only. Listed under "Classic Fiat steering wheel". here you go hawk, found this for you boss will fit beta spline.